Dramatic dried-up river channels over a mile wide and 650 feet deep have been detected on Mars, showcasing how the Red Planet once hosted liquid water at its surface. 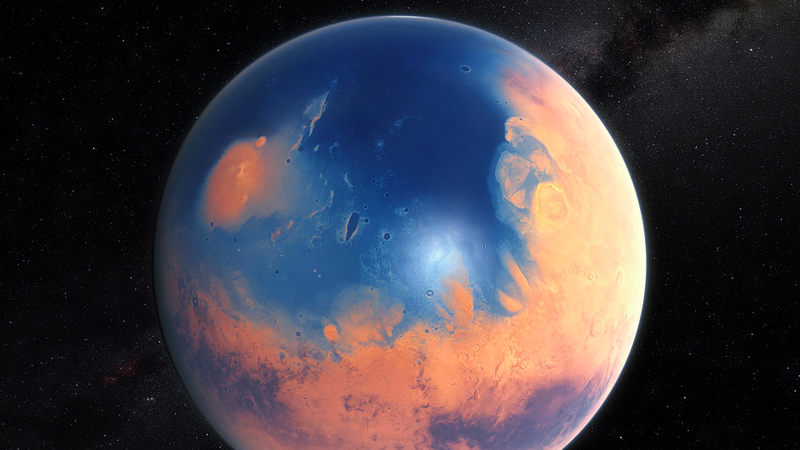 We know Mars today as a barren wasteland, but around 3.4 billion years ago, the Red Planet was awash in blue, featuring a large ocean in its northern hemisphere, lakes, and many winding rivers. During its ancient past, Mars had a thick, warm atmosphere, enabling the planet to sustain liquid water at the surface. Observations from satellites in orbit around Mars and rovers on the surface have provided the evidence for this, be it in the form of dried-up riverbeds or clay-like deposits requiring the presence of water to form. Eventually, however, the thick Martian atmosphere evaporated, and along with it, the planet’s surface water. Today, visible evidence of this water can still be seen as frozen ice at the poles. New images released yesterday by the European Space Agency (ESA) offer further evidence of Mars’ watery past. The region shown in the photos is a system of valleys located in the southern highlands, just east of a large impact crater called Huygens. The photos, captured by the ESA’s Mars Express satellite late last year, show an ancient, heavily cratered region that, despite aeons of erosion, still exhibits the tell-tale signs of flowing water. Overall, the valley system appears to branch out significantly, forming a pattern a little like tree branches stemming from a central trunk. This kind of morphology is known as ‘dendritic’ – the term is derived from the Greek word for tree (dendron), and it is easy to see why. Various channels split off from the central valley, forming little tributaries that often split again on their journey outwards. This kind of dendritic structure is also seen in drainage systems on Earth. A particularly good example is that of the Yarlung Tsangpo river, which snakes its way from its source in western Tibet down through China, India, and Bangladesh. In the case of this image of Mars, these branching channels were likely formed by surface water runoff from a once-strong river flow, combined with extensive rainfall. This flow is thought to have cut through existing terrain on Mars, forging new paths and carving a new landscape. The presence of rushing ancient water on Mars raises many questions. What was the source of this rushing water? Was it caused by melting glaciers, or was it water pouring out from below the surface? Or did rain generate the flowing water? And how long did this water last before it dried up? Importantly, did this water contribute to habitable conditions on Mars, and did life once appear on the planet?